For some reason I haven’t gotten around to mentioning anything about Georgian food, so I thought I’d quickly post a picture or two. To the left is a plate of khinkali, fantastic dumplings filled with spiced minced beef. Quite simple fare, actually, but incredibly delicious; it’s one of the staples of the Georgian diet, and there are khinkali restaurants all over town, including a number of 24-hour places. There’s a specific method with which to eat them—as they’re cooked, the meat inside releases its juices, and haphazard eating can be very messy. First one dusts the conical, top part of them with pepper. Then one holds it upside-down by the doughy ‘hat’, nibble or carefully bite somewhere on the circumference, and then pour the juice into one’s mouth. One can then work one’s way around the rest of the dumpling without dribbling or spilling anything. Expert khinkali eaters can incorporate the imbibing of the juices into the initial bite, and so munch away as with an apple, and not make a mess. Knowing my fondness for khinkali, Khatuna kindly brought some over a few days ago that I can make myself here at home, simply drop them into boiling water and let them cook for 7-8 minutes. Haven’t tried them yet; waiting for a the next time I need a khinkali fix. This is a version of the other main dish in Georgia, khachapuri. 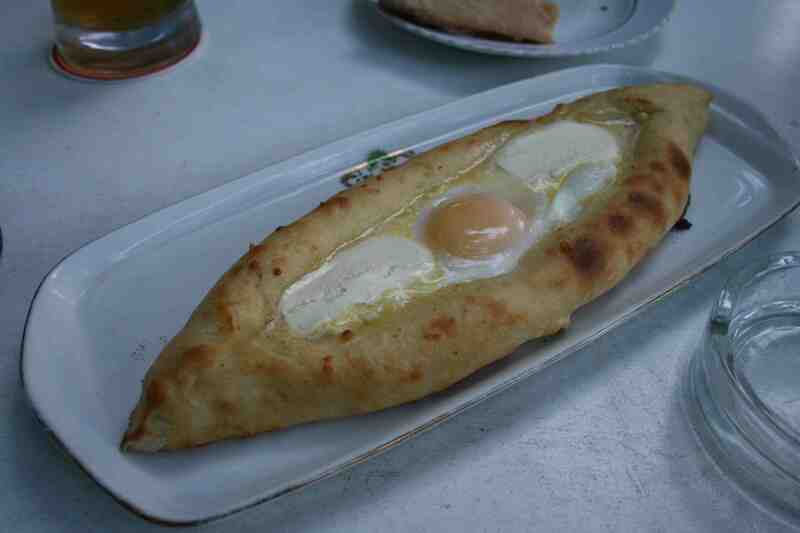 This one’s khachapuri adjaruli (eg., from Adjara in the west): the bread is formed like a boat, the inside of which is filled with salty Georgian cheese, on top of which is placed a semi-cooked egg and large chunks of butter. My guide-book describes it as a “calorie-injection”, which sounds about right. 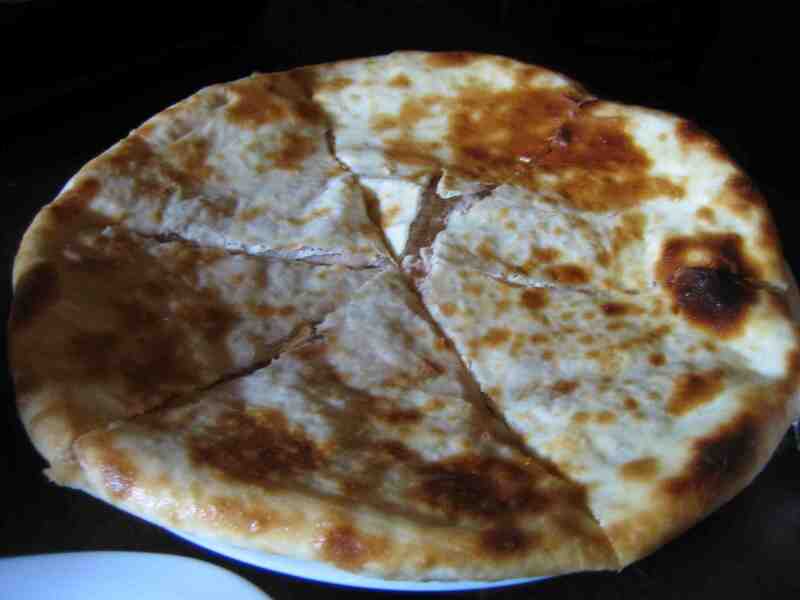 There are a number of different kinds of khachapuri, most of them being circular, pizza-shaped disks of bread with various fillings: imeruli is filled with cheese; megruli has cheese both inside and sprinkled on top (see photo below right. This picture was taken at a supra given by Sian and Dion, who cooked up a storm shortly after moving into their new apartment. 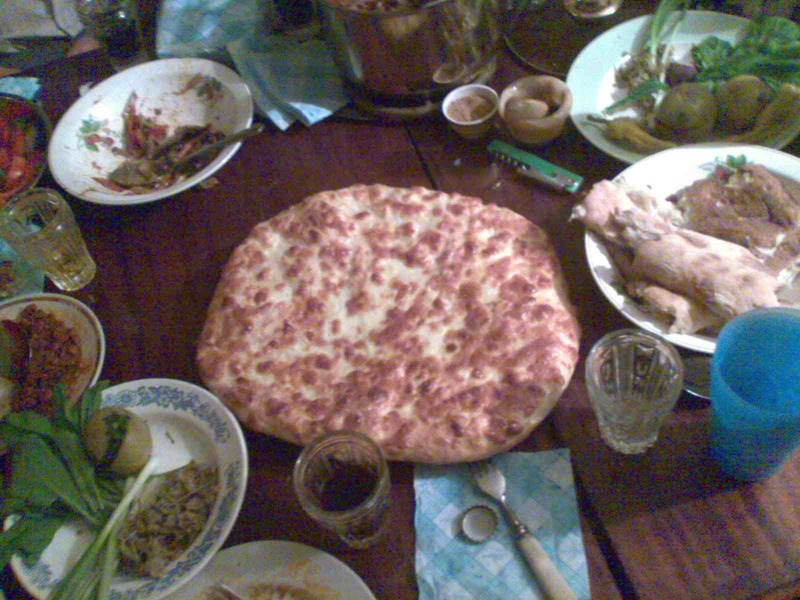 During the dinner, their neighbour knocked on the door and presented them with this enormous, and delicious, khachapuri megruli. Everyone was quite full by this time, but it went pretty quickly); penovani is square and folded into four quarters, with the cheese inside. 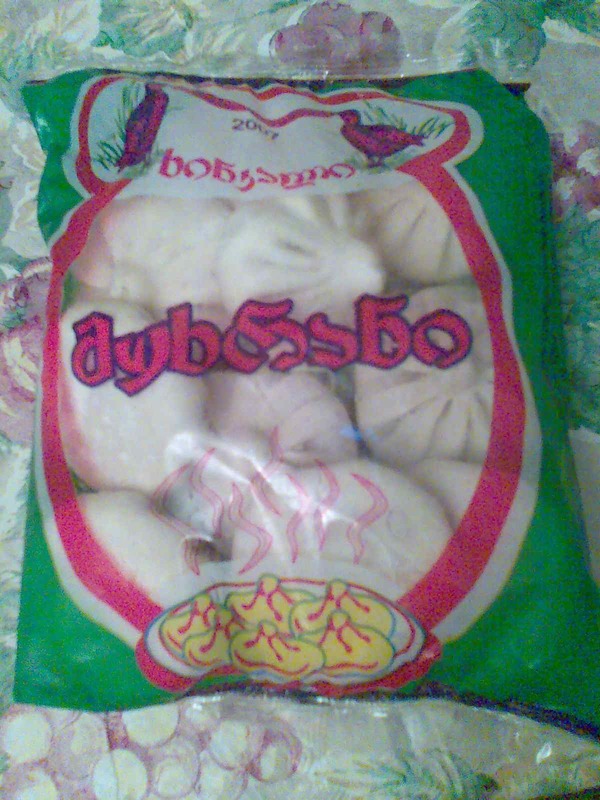 A similar thing is lobiani (left), the same pizza-bread-like circle, but filled with bean-paste. The beans here are excellent, and are served in a variety of ways; one of the best is stewed into a soupy consistency which is great with Georgian bread. The beans are large and brown, and look and taste very similar to Italian borlotti beans. Other standard dishes include shashlik (grilled skewered bits of meat, generally beef or pork), kababi (a grilled cylinder of ground beef wrapped in lavash), and various salads. One novelty, which I tried two weeks ago after the Friday session at the Abano (steam baths), was—according to the Danish guy who ordered it—avian gullets. There is, he explained, an organ that only birds have, which helps to grind hard food, like corn kernels or seeds, either before or after it passes through the stomach. They looked like dark, wrinkly mushrooms, and had a rather nondescript, meaty texture, the flavour coming mainly from the sauce in which it is cooked. Just about everyone turned up their noses at it, but it was actually quite good. the boat one looks amazing! What about Georgian drinks? I didn’t get time for lagidze waters when I was there. Are they still there? Did you tried? yo, the lagidze waters are the sparkling mineral waters with the syrup in it. that khachpuri place that was downstairs off of rustaveli was called Lagidze actually, cause they had those soft drinks. Really great stuff. Zia – I’m afraid I personally don’t know how to make khachapuri; I did find these links, however; hope they help! Andro – glad to have been of use! I love khachapuri, specially acharuli! it is delicious!